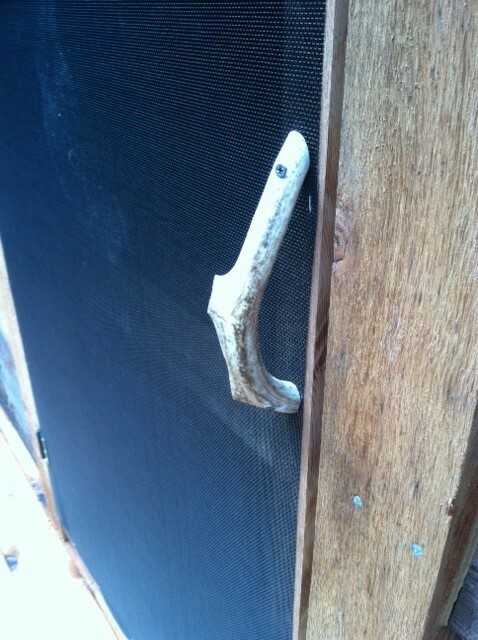 Do you remember the way screen doors used to be? Just a rectangular wooden box with a big spring that went “bwong bwong bwong” as you opened the door farther? I like those doors. I like them a lot. They remind me of so many things. My favorite one was on the tiny shack of The Clown, the Lake of the Ozarks first floating restaurant. The handle was a giant hand carved clown head. It had an exceptional “whack” when it shut too! 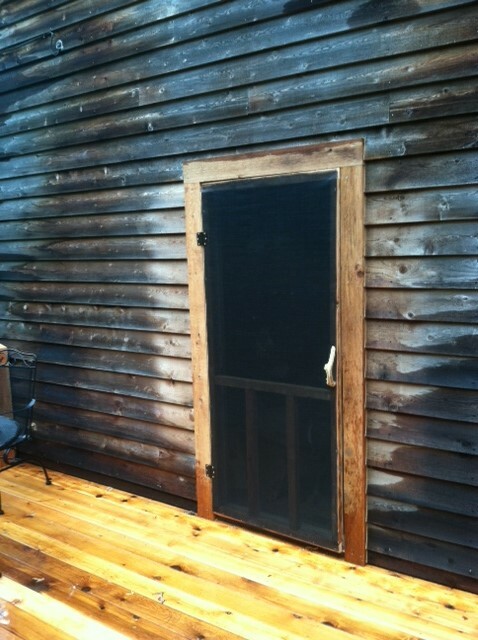 Since I happen to be in the market for a screen door, I decided to build one. I had some rough cut cedar left over from the deck construction, but it was all 2×6 and I needed 2×2. 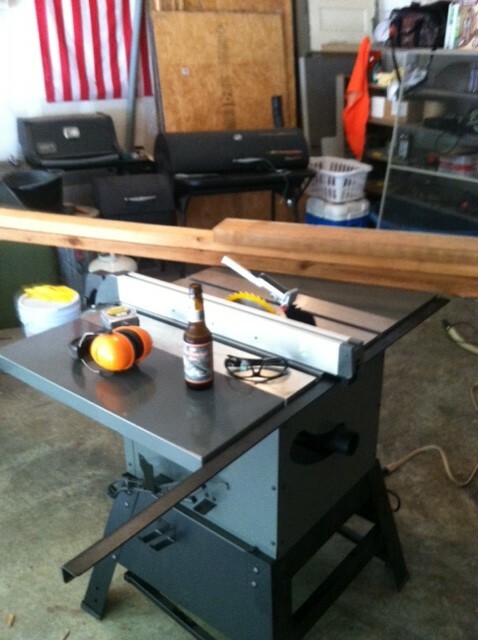 I guess I could go buy some 2×2….hey wait, I bet it would be easier to just buy an awesome table saw and rip those 2×6’s into the size I need. Yeah, that seems much easier. So, here’s how you make an old school screen door. Gather safety gear so that you know you have it. Also open a beer. This is an important project, I highly recommend a high alcohol IPA, that way you don’t have to stop every ten minutes to get more beer. Now it’s time to get to ripping the lumber. I suggest you wear flip flops, because it’s summer and that’s what you wear in summer. Even with the respirator, I had a major nose-splosion later. After ripping it down to size it’s really easy. I mortared the corners of my door, but that was only because I wanted to use the new table saw some more. Then I stapled the screening onto it. so tired of all this racket!! The spring is important. You want to get one that makes the right noise. I found one that was Stanley brand on Amazon and many of the reviewers mentioned it made the right noise (I am not the only crazy one) and sure enough, it did! For kicks, I made the door handle out of deer antler. 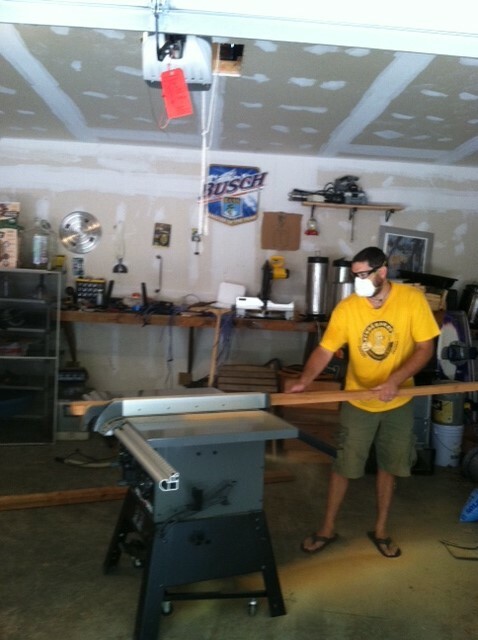 Mostly because I love the smell of antler cut at high speeds with a chop saw (imagine burning fingernails…it’s awful). I could have counter sunk the screw heads, but I like them exposed. The uprights are in the door frame simply to remind the dogs (and my drunken self) that a door is in fact there. 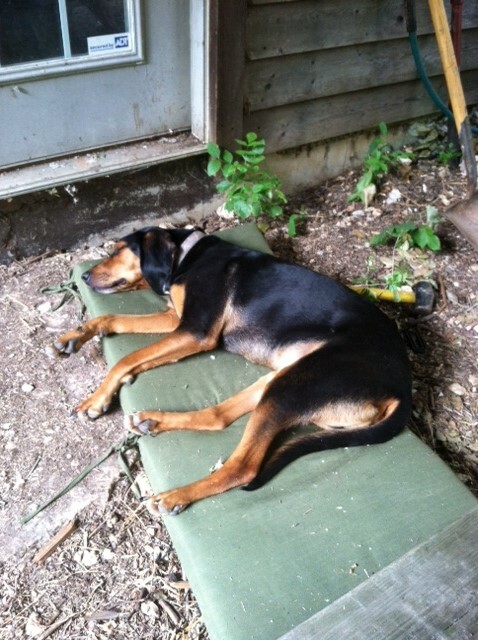 It even makes the right noise, which makes the entire deck construction project a success. 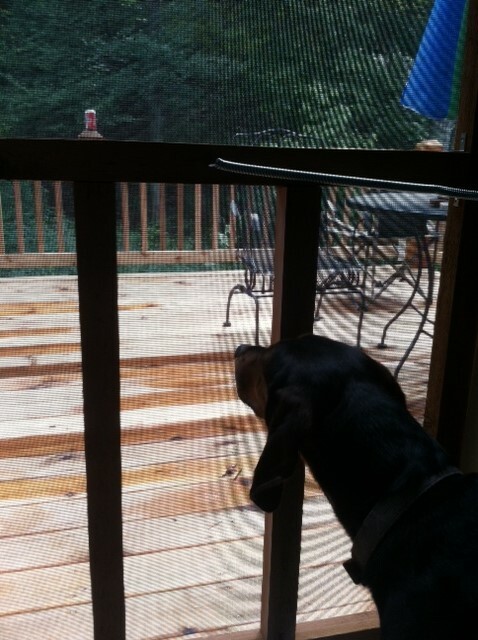 Yes, the whole point of the deck was to be able to build this screen door and use it. This entry was posted in Wood stuff and tagged Building Materials, Clown, Door, Home and Garden, Home Improvement, Lake of the Ozarks, Materials and Supplies, Missouri, nick offerman, Screen door, Shopping, The Clown. Bookmark the permalink. But do me a favor? If woodworking plays into any future books, let me beta those parts for you? You may have used your table saw to miter the corners. You might have even used it to help with mortise (and tenon) joints in the corner. But I’m reasonably sure you didn’t mortar them, at least not with a table saw! Ha, that would be correct! I know how to build stuff, I just don’t know what most of what I am doing is actually called. OMG! Got so excited by the notion of using deer antlers for door pulls! And I just happen to have a few laying around in the barn. Just can’t find these kinds of household hints on pinterest!